It would seem that the holidays are now officially over. Everyone is getting back to their normal schedules and trying to get their houses back in order! Well, your Christmas cactus is doing the same thing. If your Christmas cactus is anything like mine, it provided you with bountiful blooms over the holiday season. My blooms have all died now and it's time to pinch off the spent blooms so the plant can return to looking green and healthy! 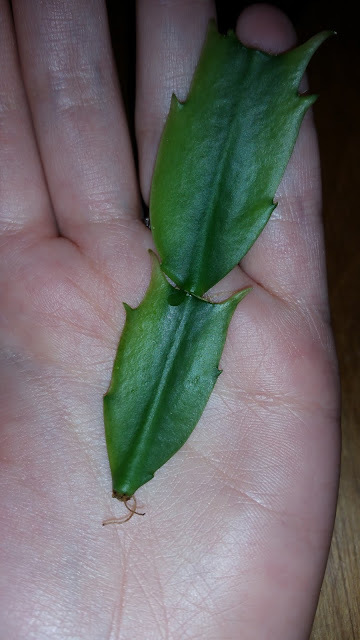 While doing so, I thought it would be a good time to take some cuttings and make a new plant. I will eventually gift the new plant to my sister in law. She also loves plants and gardening. 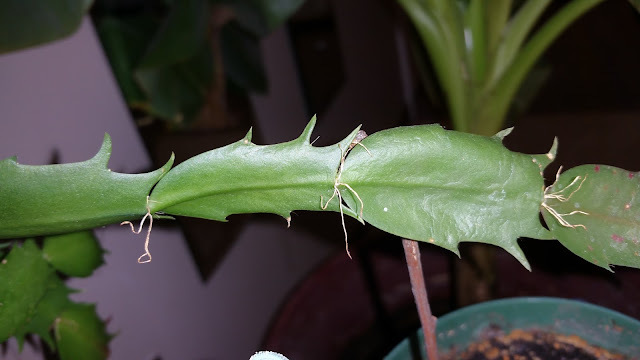 My Christmas cactus originally came from a cutting from my mom's plant. Her plant is about twenty-five years old and it was always my favorite houseplant of hers when I was a child. Mine is about three years old now. It began flowering after its first year of life, which is pretty good! I keep it in an east facing window and water it sparingly once every week or two. It seems pretty happy. So, without further adieu, let's get down to the brass tacks. I want to share with you how to easily grow a Christmas cactus from cuttings, or propagate as the experts call it! Ok, now for the fun part. Take a look at your Christmas cactus. In the spot where segments join one another, look for a joint that contains little hairy filaments growing from it. These are root buds. Ideally, we want to take a cutting that already has some of these root buds. If you cannot find a joint that has these, that is perfectly okay. Your plant will likely do just fine without the head start . Look at all those roots! You can either use a pair of scissors of your fingernail to gently remove a segment of 1-3 pieces at the joint. 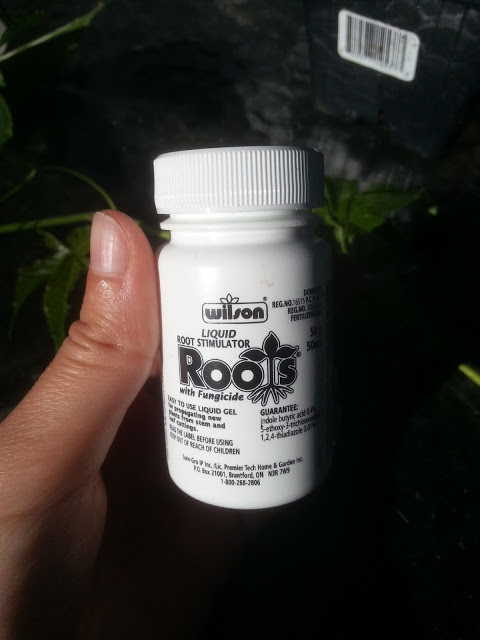 Make sure to get some of the air roots if you can. Set your cutting aside. Check out the roots at the bottom! Fill your pot with soil and compact it down gently so that the surface is fairly firm. Water the soil thoroughly. Stick your support of choice into the soil, I used a stick. Using a support is important because We just want the root tip of the cutting in the soil so it will need something to lean up against. Dip the root side of your cutting (the side that you cut) into your rooting hormone. This will both increase the odds that your cutting will take root and speed up the process. Gently place your cutting, root side down into the soil. It doesn't need to be pressed in very deeply, just as long as it is maintaining contact with the soil the roots will take hold. Use the support stick to lean the cutting against. Place your new plant in a safe place where it won't be bumped for the next few weeks. Water it sparingly when the soil becomes dry to the touch. Do not over water as this might cause the cutting to rot. 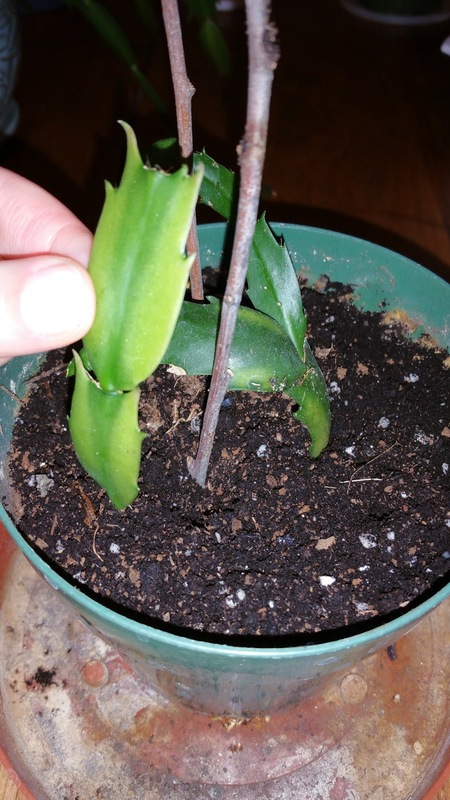 Your little cuttings should develop roots within a couple of months. I like to write down on the calendar when I started the rooting project, as it's so easy to forget. In a few months, once the roots have had a chance to take a strong hold, you can feel free to re-pot your plant into a pretty decorative pot. 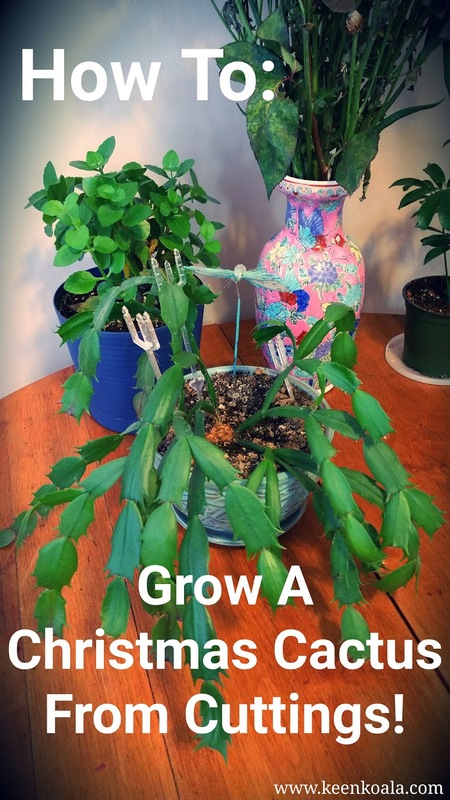 Then, in a few years, I hope that you will have a beautiful and healthy mature Christmas Cactus like mine! 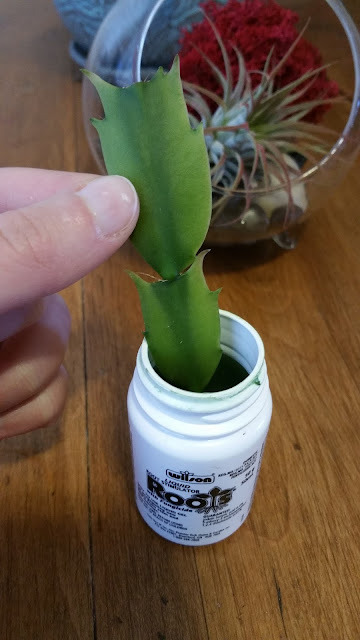 Have you ever propagated house plants before from cuttings? Which ones have you tried? Let me know in the comments section below, I would love to hear from you. For instant access to the latest posts, exclusive content, and contests, 'LIKE' Keen Koala on Facebook by clicking HERE!